Royal Family Orders in Britain date back to George IV and are still in existence today, given to female members of the royal family. They take the form of a portrait of the sovereign set in a jeweled frame and mounted on a bow. 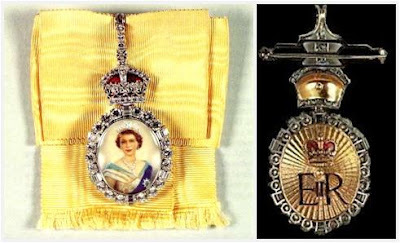 I've written about the practice in general (and in other countries) at Order of Splendor; I've also written about the Orders worn by The Queen specifically (from her father and grandfather) on this blog. The Queen obviously has a Royal Family Order of her own to bestow upon the women of the royal family, and it is the one currently worn by The Duchess of Cornwall. 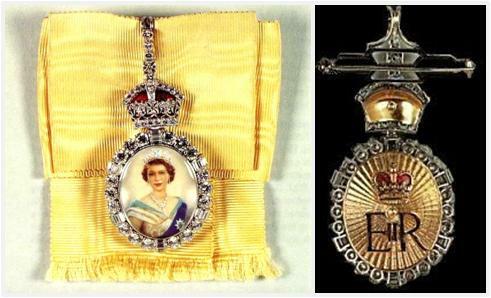 The Queen's Order features a portrait of herself wearing the George IV State Diadem, the Order of the Garter Riband and Star, the Bahrain Pearl Drop Earrings, and the Nizam of Hyderabad Necklace. The image is taken from the famous portrait series by Dorothy Wilding in 1952 and is painted on ivory and framed by diamonds; the diamond surround changes from reign to reign, and the version here has three brilliant diamonds between diamond baguettes all the way around, topped by a diamond Tudor crown over a red enamel cap of maintenance. Her cypher adorns the gold back side, and the medal is mounted on a pale yellow square moire silk bow with a fringe. The Duchess of Cornwall was first seen wearing the Royal Family Order for the Saudi Arabian state banquet on October 30, 2007. The Duchess of Cambridge first wore her Royal Family Order, which is made using glass instead of ivory, to the 2017 Diplomatic Reception; it was first seen at the 2018 Dutch state banquet. These are usually worn at tiara occasions, but - as shown above - there are some other occasions at which they may be worn. The Duchess of Cornwall can most frequently be seen wearing hers for state events, such as state banquets and the State Opening of Parliament, and also occasionally for other events.